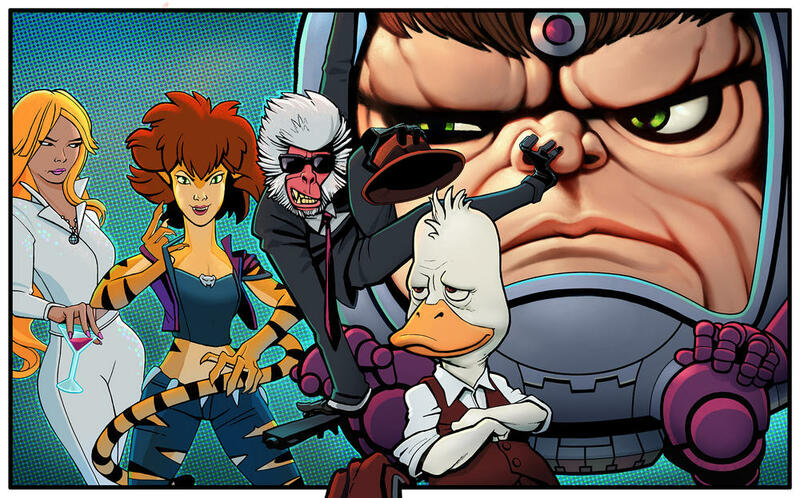 Enlarge / This single teaser image of characters Dazzler, Tigra, Hit-Monkey, Howard the Duck, and M.O.D.O.K. (L-R) seems to indicate the art style of each upcoming Hulu series, as we didn’t immediately recognize these drawings from existing comics issues. Marvel Entertainment’s shift away from Netflix became clearer on Monday with the announcement of a massive new multi-series initiative, dubbed The Offenders. Announced as part of a Television Critics Association press tour, this collection of four animated series revolves around a few Marvel Universe misfit characters—and it will land exclusively on Hulu. That streaming-service destination makes some sense, as Marvel Entertainment is already two seasons into its Runaways series as a Hulu exclusive. But the news also emerges days after Marvel’s corporate parent Disney talked up sweeping content plans for its own upcoming video-streaming service, Disney Plus. Notably missing from that list of writers is George Lucas, who infamously botched Howard the Duck‘s biggest mainstream moment in a 1986 feature film. Meanwhile, M.O.D.O.K.’s popularity as a maniacal, inefficient villain seems like a good match for the comedy of Oswalt and Blum (American Dad, Community), while we’ll have to see what exactly the co-directing duo of Gordon and Speck, best known for 2017’s Office Christmas Party, can do with an anti-hero like Hit Monkey. The most intriguing entry on this list may very well be Tigra and Dazzler, which will combine a standalone ’70s hero with an X-Men character perhaps best known for being plucky in the ’90s cartoon (respectively). Netflix series host and comedian Chelsea Handler will team up with South Park vet Erica Rivinoja to write this series, which will be set in Los Angeles and put the heroes together as “best friends” (in spite of the two heroes having little contact in comic books up until this point). Out of all these off-kilter announced series, this one—even with only a vague description—seems most poised to feel refreshing compared to the usual Marvel comic-TV fare. The news follows Marvel and Netflix announcing one–by–one cancellations for its live-action Defenders series, with only Jessica Jones and The Punisher remaining on the chopping block. Weirdly, Marvel is continuing its convention of “four series announced with one cross-over special,” as the aforementioned four animated series will come together for a special presentation, called “The Offenders,” on a date to be determined.